If you are new to the world of wheelchairs, you might not know that not all wheelchairs are created equal. For example, there are differences between standard wheelchairs and lightweight wheelchairs. Like their name suggests, lightweight wheelchairs are much easier to pick up and travel with than your typical heavy wheelchair. These manual wheelchairs trade off some of the durability of heavy duty construction in exchange for increased mobility. Another special type of wheelchair is the transport wheelchair, which unlike standard and power wheelchairs require a caregiver to push the chair in order to move it. While standard wheelchairs have their benefits, lightweight chairs prove to be best for transportation. When paired with a portable wheelchair ramp they can make much easier to restore mobility to a loved one that requires a wheelchair. How Important Is a Lightweight Wheelchair? If you have a loved one in a wheelchair, you want to ensure that they can be transported as comfortably and easily as possible; lightweight wheelchairs can make that happen. When it comes to transporting patients, a lightweight wheelchair is instrumental for caregivers. This is due to the many benefits these chairs can provide. Compact – Lightweight wheelchairs are not bulky like typical wheelchairs, and oftentimes they can conveniently fold up to fit into tight spaces in a vehicle. Lightweight – A heavy wheelchair discourages handicapped individuals from ever leaving the comfort and convenience of their home, which is why transport wheelchairs can make such a positive lifestyle change. For example, some wheelchair users may be able to stand upright for long enough to pick up their wheelchair, put it in the trunk, and walk the short distance to the driver’s seat. This alone can drastically improve their quality of life, allowing them the freedom to travel alone, without relying on costly caregivers. Portable – Portability is a crucial element in transport wheelchairs, which is one reason why lightweight wheelchairs are so handy. The seat and elevating leg rests in transport chairs typically fold up into a compact size, so they are easily stored in a car trunk or back of a van. Mobile – While the fact that these chairs are lightweight and compact make them easier for caregivers to move and transport wherever they need to go, lightweight transport wheelchairs also make it easier for the handicapped individual to maneuver themselves around. A heavy manual wheelchair is nearly impossible to push yourself around in, which significantly reduces your mobility. Everybody’s individual situation is different, especially with their handicap transportation needs. Determining the best lightweight transport wheelchair can be tough because there are so many great options available to you, but we will help you narrow it down. The NOVA Lightweight Transport Chair has a sleek black design with a colored frame that comes in blue or red. It weighs 27.5 pounds in all and has an impressive weight capacity of 300 pounds. The seat itself is quite comfortable with padded upholstery and reinforced arm pads that are designed to protect the wheelchair from any potential ripping or stretching. Incredibly Safe – With the NOVA Feather Touch hand brakes, the brakes can be conveniently locked whenever you need to, allowing the wheelchair to be safely parked or transported over inclines and even bumpy terrain. Foldable – This NOVA wheelchair comes with a quick release fold down back, making it perfect for efficiently folding up and placing in and out of a vehicle. Easy To Travel With – All the features of this chair enhance its high level of portability. Extremely Durable – This chair is almost 30 pounds, but that means it isn’t some flimsy wheelchair that will fall apart after just a few uses. Users are thrilled with the durability of this wheelchair, and it feels sturdy while in use, which is very important. With the chair weighing almost 30 pounds, some people found it a little tough to lift easily. Fortunately, the removable footrests come in handy here – by removing them, the chair becomes much easier to lift and place in the back of your car. This chair is very easy to push yourself or someone else in, and it provides a very smooth ride. Overall, this highly rated chair is recommended often by both users as well as on reputable merchant sites such as Amazon. 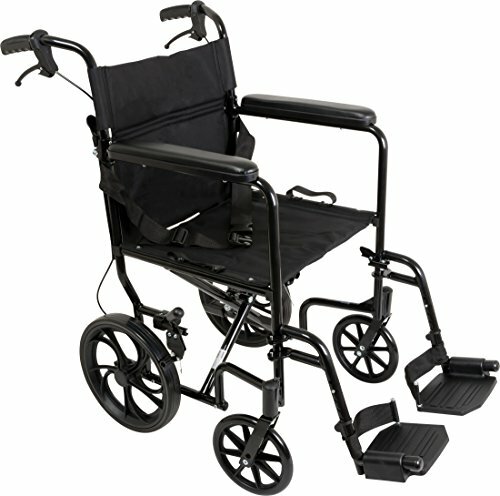 IDEAL FOR TRANSPORT, TRAVEL & SAFETY - Much easier for transporting and travel than a wheelchair. Our unique design is lightweight, simple to maneuver and folds easily and compactly. Comes with secondary wheel locks for added safety. EASY USER TRANSFER - Flip up and removable padded desk arms make transferring the user from a car, bed or chair much easier. Desk arms allow the user/transport chair to "ride up" to a desk or dining table. SPECIFICATIONS - Weight capacity: 300 pounds; Seat dimensions: 18.25"W x 15.5"D; Seat height: 20"; Opened overall width: 25"; Product weight: 27.35 lb; Back height from seat: 18"; Arm height from seat: 10". This lightweight chair is only 22 pounds, making it perfect for those who struggle with lifting heavy objects. Don’t let the small weight on this chair fool you – it still features a 300-pound weight capacity. Go Anywhere – The ProBasics 19-Inch Transport Aluminum Wheelchair helps you travel anywhere thanks to the sturdy rear wheels. Packs Up Easily – This ProBasics transport wheelchair is designed with an easy fold mechanism to allow it to be stored simply and efficiently as the handles can be strapped to the seat. The wheelchair’s flared handle design is both comfortable for the caregiver who is pushing the wheelchair and helps the easy back-release hinge for easy and compact folding for both transportation and storage. Despite how lightweight this wheelchair is, it still proves itself to be quite durable in transporting anyone up to 300 pounds. It performs very well in narrow spaces, allowing the caregiver to easily maneuver the wheelchair in any home or business hallway. 12-INCH REAR WHEELS: This Transport wheelchair has large 12-inch rear wheels for better performance on uneven surfaces and a smoother comfortable ride. A portable wheelchair that is safe, very comfortable, and perfect for travel or everyday use. SAFETY FEATURES: Transport chair has an adjustable seat belt for added user safety. User activated push-to-lock brakes & companion-activated lockable hand brakes for safety and stability when entering and exiting the transport wheel chair. CONVENIENCE FEATURES: This folding transport wheel chair has flared handles with companion-activated lockable hand brakes for safety. Padded seat tool-free swing away foot rests with composite footplates and heel loops. Nylon seat straps for folding and lifting. WHEELCHAIRS FOR ADULTS: Trust in the ProBasics brand, a leading provider of lightweight wheelchairs for adults. Our company's purpose is to improve the lives of our customers. Rest easy knowing our wheel chairs live up to your high standards. 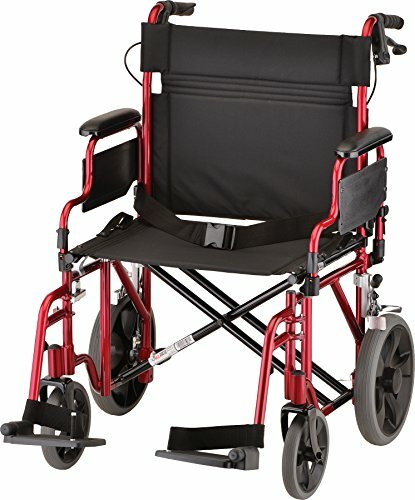 The NOVA Medical Products 22” Heavy Duty Transport Wheelchair sports an impressive weight capacity of up to 400 pounds. Extra Wide – The additional seat width provided by this NOVA chair gives the user additional comfort, especially if narrower chairs have proven to be too confining. Lightweight Frame – While the frame of this chair is made of durable aluminum, it is still lightweight, offering the best of both worlds. Users of this wheelchair tend to really enjoy the unique arm rest design of this chair. The specially designed desk arms are shorter than normal arm rests and are positioned at an angle to allow the user to roll directly up to a dining table, desk, or any other surface table, which often has proven impossible with normal wheelchair arm designs. The convenient flip up desk arms also give you the opportunity to easily use the wheelchair as a table or as a desk. 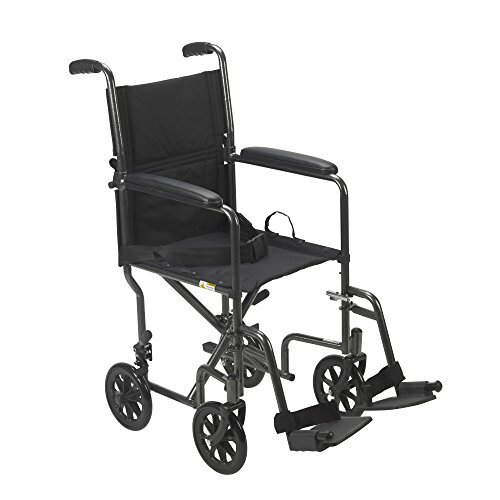 The Medline Lightweight Transport Adult Folding Wheelchair is designed to help caregivers transport people as safely, comfortably, and easily as possible. Ultra-Durable – The metal frame of this wheelchair is made of durable aluminum that is supported by a powder coating to help protect it from any rust or general deterioration down the road. 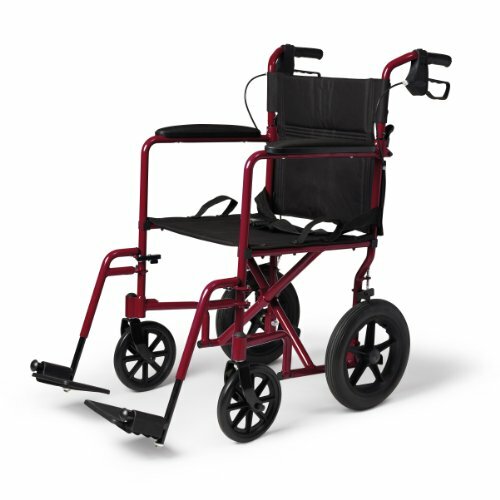 Great Outdoor Performance – The large rear wheels on this design ensure high-quality performance on even the most unsteady outdoor flooring, ensuring that this wheelchair can safely transport your loved one even when the sidewalk ends and they have to do a little off-roading. Breathable Material – The nylon upholstery of this wide seat is layered for additional support and reinforcement, but it is also extremely breathable, ensuring that the occupant does not get overheated at all during their transportation. Easy Storage – This chair folds up nicely, and its ease of storage is only increased with the convenient detachable footrests. This wheelchair really lives up to its other positive reviews – the loop-lock handbrakes are very easy to use, and they work with the seat belt to ensure maximum safety to the user. Both the handles and the footrest heights are adjustable, and the seat itself is quite comfortable. This transporter can handle any kind of outing you need it to, whether you are traveling by car, up and down hills by foot, bumpy streets, uneven sidewalks, and even going across a lawn. 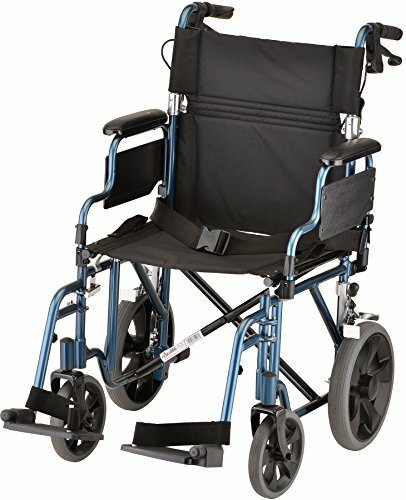 The Drive Medical Lightweight Steel Transport Wheelchair, unlike the other listed wheelchair options, has the same size wheels in both the front and rear of the chair. This helps the chair require little maintenance while still performing just as well as any other transport chair. Easy to Clean – The nylon upholstery is simple to clean, so you don’t have to work up a sweat if any accidental spills occur during transportation. Durable – The steel frame of this wheelchair offers reliable stability while still being lightweight and easy to maneuver. Comfortable – The cushioned armrests prevent any potential arm pain for the user. The swing away footrests are an incredibly handy feature of this transport wheelchair, allowing the user to sit down and get up without worrying about tripping over the footrests. This durable chair travels well over rough terrain, and it packs away in a car without any hassle. Hopefully this gives you an idea of the transport wheelchairs available. There are a great many different brands available, along with wheelchair accessories that will make life in a chair easier to manage. There are also other mobility aids, such as knee walkers and travel scooters that can assist with a variety of mobility challenges. Chair Accessories – Items like baskets and cup holders can make transporting basic items much easier. Raised Toilet Seats – Getting onto and off the toilet can be difficult for those with mobility issues. A raised seat makes the distance to travel much easier to manage. Bed Rails – A set of rails can both keep a loved one from rolling out of bed, and also make it easier to raise and lower themselves into and out of bed. Bath Benches – Bathing is significantly complicated by mobility issues. A good bath chair can make it much easier to keep up with personal hygiene. Seat Cushion – Spending too much time in one position can lead to pressure sores and other problems. Getting a good coccyx cushion or Roho seat cushion can help alleviate pain and prevent chafing. Folding Canes – For people who can walk short distances by themselves, having and easy to carry cane with them in their transport chair can make for easier mobility once they reach their destination. What Is A Roho Cushion? How Much Is A Wheelchair? How Do You Use a Hoyer Lift? What Does Durable Medical Equipment Mean? Copyright © 2019, HelpAndWellness.com. All rights reserved.